Automize is a task scheduler and automation software that can automate a variety of tasks, including ftp transfers, ftp monitoring, web downloads, web site monitoring, email checking and sending, telnet, ping, directory monitoring and more. You can choose the task from one of the many categories and then customize it to your needs. Automize contains several pre-configured tasks, not commonly found in other applications, this includes automated SQL database queries, support for MS Office tasks, CGI testing and more. All of them offer a simple template that you can customize. 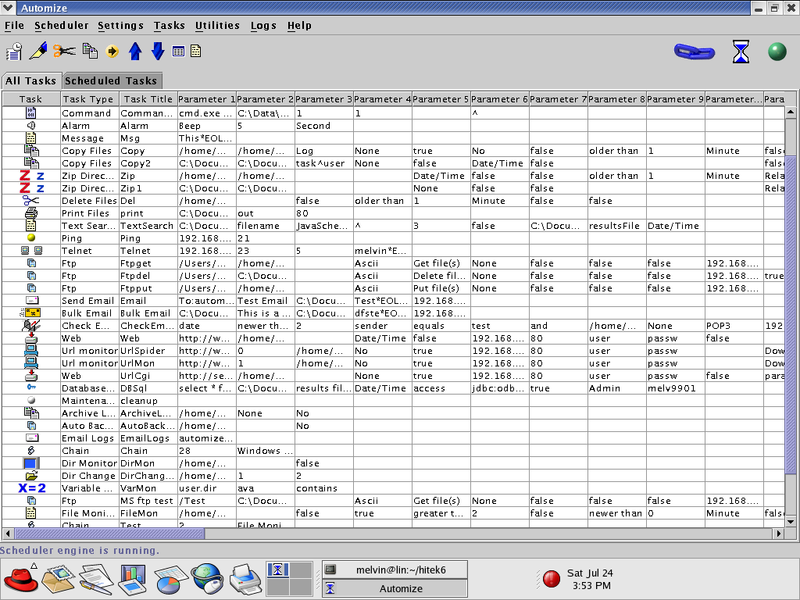 In addition, the chaining feature can run tasks in sequence or conditionally depending on exit codes. Scheduler tasks can be run by the second or minute, or on a hourly, daily, weekly, or monthly basis. Additional features include email notifications on task failure, FTP browsing, ZIP file viewer, extensive logging, remote task control and more. It supports dynamic variables to achieve advanced automation tasks. The program is written in Java and therefore cross-platform compatible.